SoundMagic's E10 headphones go wireless | What Hi-Fi? The SoundMagic E10BTs have Bluetooth 4.2 connectivity, can support high-res audio and have a claimed battery life of more than 10 hours. SoundMagic's E10 headphones, which we reviewed back in 2013 (and enjoyed so much we gave them an Award) have been revitalised as a pair of Bluetooth in-ears. 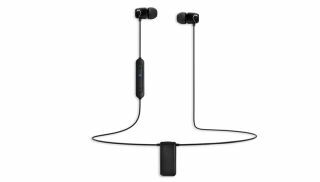 The aptly named E10BTs have Bluetooth 4.2 connectivity, can support 24-bit high resolution audio and can be played wirelessly for between 10 and 12 hours, according to the company. On the left wire are the three-button playback control unit, as well as a microphone for phone calls or your phone's smart assistant. Despite the similar name, they don't quite have the same specifications as the standard SoundMagic E10s; the drivers on the Bluetooth version are slightly larger - 14mm instead of 10mm - and the headphones cover a smaller frequency range than their wired counterparts. If you want to pick up a pair, they're priced at £70 and available now.